Married Name Her married name was Dargel. Betty (?) married Frederick Dargel, son of Herman Henry Dargel and Bessie Alford. Betty (?) died before August 2010. Gloria DeBeir was born on 20 August 1938 at Wisconsin. She was the daughter of Robert C. DeBeir and Esther Dargel. Gloria DeBeir died on 20 July 1982 at Wisconsin at age 43. 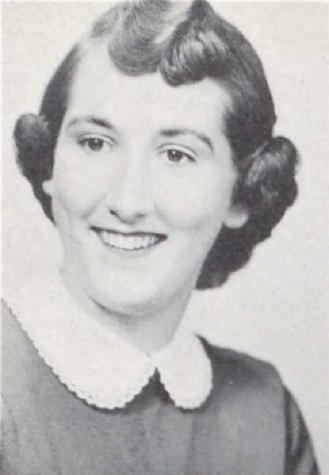 Gloria DeBeir graduated in 1956 at Reedsburg High School, Reedsburg, Sauk, Wisconsin. Mark Giese was the son of Gloria DeBeir. Mark Giese died before 2003. Married Name before December 2003 As of before December 2003,her married name was Dargel. Ruth (?) married Herbert E. Dargel, son of Herman Henry Dargel and Bessie Alford, before December 2003. Ruth (?) died in August 2010. Merle P. Berg was born on 10 March 1914 at Wisconsin. He was the son of Sanfred Berg and Mary Rockney. Merle P. Berg married Lola Amanda Olson, daughter of Oscar Olson and Olga Bakken, on 18 February 1939. Merle P. Berg died on 4 January 2007 at age 92 Merle P. Berg, age 92, died peacefully surrounded by his loving family, on Thursday, Jan. 4, 2007, in Stoughton. He was born on March 10, 1914, in Utica, the oldest son of Sanfred and Mary (Rockney) Berg. Merle married Lola Olson on Feb. 18, 1939, at the West Koshkonong Parsonage. Merle worked at Highway Trailer in Stoughton and Edgerton before retiring in 1977. He was an active member of West Koshkonong Lutheran Church and was on the church cemetery mowing team for many years. Merle was an avid gardener. He raised delicious vegetables and grew beautiful flowers. He loved to shop and he was always buying things for his great-grandchildren. He was a devoted husband, a dedicated father, a loving grandfather and he considered his three great-grandchildren one of the biggest blessings in his life. Merle had a wonderful sense of humor and a grateful nature. He was very generous and always had a ready smile, a package of gum and a Hershey bar to share with his many friends and acquaintances. Merle will be dearly missed by his four daughters, Sandra (Thomas Florin) Stai, June (Jim) Bunting, Beverly (Roger) Thompson of Stoughton and Audrey (Arlan) DeBeir of Cottage Grove; two grandchildren, Amy (Scott) Anderson and Rebecca (Ryan) Petersen; three great-grandchildren, Dayne and Megan Anderson and Miles Petersen; his "baby" brother, Herbert (Shorty) Berg and his sister-in-law, Sharon Berg; along with many nieces and nephews. Merle was preceded in death by his beloved wife, Lola; his parents; a brother, Robert Berg; and two sisters, Theressa (Stanley) Burthe and Alverda (Giles) Olson. Funeral services will be held on Monday, Jan. 8, 2006, at 11 a.m. at WEST KOSHKONONG LUTHERAN CHURCH, 1911 Koshkonong Road, with the Rev. Richard Dowling officiating. Burial will follow in the church cemetery. Friends may call at the funeral home on Sunday, Jan. 7, 2007, from 2 p.m. until 4 p.m. and at the church on Monday from 10 a.m. until the time of services. Sanfred Berg married Mary Rockney. Married Name Her married name was Berg. Mary Rockney married Sanfred Berg. Married Name 18 February 1939 As of 18 February 1939,her married name was Berg. Lola Amanda Olson was born on 19 December 1918 at Wisconsin. She was the daughter of Oscar Olson and Olga Bakken. Lola Amanda Olson married Merle P. Berg, son of Sanfred Berg and Mary Rockney, on 18 February 1939. Lola Amanda Olson died on 27 January 2005 at age 86 Lola Amanda Berg, age 86, died on Thursday, Jan. 27, 2005, at the Skaalen Sunset Home in Stoughton. She was born on Dec. 19, 1918, in Utica, a daughter of the late Oscar and Olga (Bakken) Olson. Lola married Merle Berg on Feb. 18, 1939, at the West Koshkonong Parsonage; they would have been married for 66 years this February. She was a very active member of West Koshkonong Lutheran Church, the church circle and taught Sunday school. When her children were in school, she was active in the PTA. Lola loved her flowers, shopping and enjoyed quilting. She made the best brownies in the world and when Lola was around no one ever went hungry. She loved being a grandmother and great-grandmother, and enjoyed baby sitting her grandchildren. Lola is going to be dearly missed by her family; her husband, Merle; daughters, Sandra (Thomas Florin) Stai of Stoughton, June (Jim) Bunting of Stoughton, Beverly (Roger) Thompson of Stoughton, and Audrey (Arlan) DeBeir of Cottage Grove; two grandchildren, Amy (Scott) Anderson and Rebecca (Ryan) Petersen; two great-grandchildren, Dayne and Megan Anderson; and a sister, Arlene Johnson of McFarland. She was preceded in death by her parents; and a brother-in-law, George Johnson. Funeral services will be held on Monday, Jan. 31, 2005, at 11 a.m. at WEST KOSHKONONG LUTHERAN CHURCH, 1911 Koshkonong Road, with the Rev. Richard Dowling officiating. Burial will follow in the church cemetery. Friends may call at the funeral home on Sunday, Jan. 30, 2005, from 3 p.m. until 5 p.m. and at the church on Monday from 10 a.m. until time of services. Robert Berg was the son of Sanfred Berg and Mary Rockney. Robert Berg died before 2007. Married Name Her married name was Burthe. Theressa Berg was the daughter of Sanfred Berg and Mary Rockney. Theressa Berg married Stanley Burthe. Theressa Berg died before 2007. Stanley Burthe married Theressa Berg, daughter of Sanfred Berg and Mary Rockney. Stanley Burthe died before 2007. Alverda Berg was the daughter of Sanfred Berg and Mary Rockney. Alverda Berg married Giles Olson. Alverda Berg died before 2007. Giles Olson married Alverda Berg, daughter of Sanfred Berg and Mary Rockney. Giles Olson died before 2007. Oscar Olson married Olga Bakken. Olga Bakken married Oscar Olson. George Johnson died before 2005. Marie Pauline Augusta Brudigam married George Julius Giese, son of Wilhelm Henry Giese and Wilhelmine Priebe. Marie Pauline Augusta Brudigam was born on 7 March 1890 at Nebraska. She died on 25 February 1960 at Nebraska at age 69. 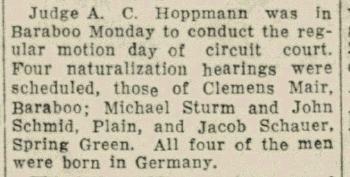 Jacob Schauer was born before 1914 at Germany. He married Agnes Mary Hetzel, daughter of John Hetzel and Barbara Pfeiffer, on 4 May 1932. 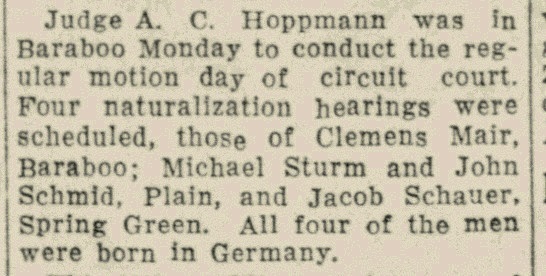 Jacob Schauer and John Schmid were naturalized on 20 April 1931 at Baraboo, Sauk, Wisconsin, Judge A C Hoppmann conducted naturalization hearings for John Schmid, of Plain, and Jacob Schauer, of Spring Green, who where both born in Germany. Leo L. Weiss married Mary Margaret Hetzel, daughter of John Hetzel and Barbara Pfeiffer, on 5 February 1933. Married Name 29 October 1935 As of 29 October 1935,her married name was Hetzel. Althea Riek was born on 9 December 1915. She was the daughter of Anton Clemens Riek and Mary Lins. Althea Riek married Herman Joseph Hetzel, son of John Hetzel and Barbara Pfeiffer, on 29 October 1935. Althea Riek died on 9 March 1998 at age 82. Raymond John Salvitti Jr. was born on 24 April 1960 at New York. He died on 11 January 2007 at age 46 Raymond John Salvitti Jr., age 46, of Stoughton, passed away unexpectedly on Thursday, Jan. 11, 2007. He was born on April 24, 1960, in Patchogue, N.Y., to Raymond John and Elaine (Cutler) Salvitti Sr. Ray grew up on Long Island, N.Y. and joined the U.S. Navy after graduating high school. While serving aboard the U.S.S. Frank Cable in Charleston, S.C., he met his future wife, Cindy Paulus. They were united in marriage on June 13, 1983. After discharge from the Navy, Ray and Cynthia resided in Wisconsin, where they had their daughter, Lisamarie. Ray worked as a sheet metal technician for many years at General Heating and Air Conditioning. He loved the outdoors, four wheeling, fishing and hunting. Ray was a devoted and loving father, who even had fun taking his daughter to the mall. He is survived by his wife, Cindy; a daughter, Lisamarie, both of Stoughton; his parents, Ray "Pop" and Elaine Salvitti of New York; a sister, Doreen (Gary); two brothers, John and Nick (Jennifer); and several nephews and nieces. A celebration of Ray's life will be held at GUNDERSON STOUGHTON FUNERAL HOME, Highway 51 North at Jackson Street, Stoughton, from 4 p.m. until 7 p.m. on Monday, Jan. 15, 2007. Charles Herman Marsh was born on 27 September 1831 at Massachusetts. He married Mary Abigail Safford, daughter of Robert Gerrish Safford and Louisa Boston, on 21 October 1853. Charles Herman Marsh died on 5 May 1864 at Virginia at age 32. Married Name 30 August 1856 As of 30 August 1856,her married name was Safford. Zerrviah Jenkins was born on 4 February 1830 at Massachusetts. She married Robert Hersey Safford, son of Robert Gerrish Safford and Louisa Boston, on 30 August 1856. Zerrviah Jenkins died on 22 February 1888 at Minnesota at age 58. Charles Edwin Bowman was the son of Fred Jay Bowman and Hulda (?). Charles Edwin Bowman died in 1920 at died in infancy. (?) Bowen married (?) Peck. Married Name Her married name was (?) Bowen. (?) Peck married (?) Bowen. Ray Walter Anderson was born circa 1894 at Massachusetts. He married Juanita W. Bowen, daughter of Albert John Bowen and Effie Pearl Sherwood, circa 1929. Ray Walter Anderson died before 1940. Ray Walter Anderson was a dental surgeon, general practice in 1930. [S250] U.S. Federal Census 1930 U.S. Federal Census, by Ancestry.com, Year: 1930; Census Place: Los Angeles, Los Angeles, California; Roll: 134; Page: 12B; Enumeration District: 55; Image: 66.0; FHL microfilm: 2339869. Walter Castator was born on 25 September 1883 at Kansas. He married Juanita W. Bowen, daughter of Albert John Bowen and Effie Pearl Sherwood, after 1940. Walter Castator died on 4 August 1953 at Los Angeles, California, at age 69. In 1950 at Voter Registrations, Los Angeles, California. Henry F. Schroeder was born in August 1861 at Iowa. He married Jessie V. Sherwood, daughter of Joseph Sherwood Sr. and Alice Ann Safford, circa 1885. [S245] U.S. Federal Census 1900 U.S. Federal Census, by Ancestry.com, Year: 1900; Census Place: Brownsdale, Mower, Minnesota; Roll: 777; Page: 1B; Enumeration District: 0097; FHL microfilm: 1240777. [S244] U.S. Federal Census 1910 U.S. Federal Census, by Ancestry.com, Year: 1910; Census Place: Paso Robles, San Luis Obispo, California; Roll: T624_104; Page: 4A; Enumeration District: 0038; FHL microfilm: 1374117. Pearl Marie Schroeder was born in December 1892 at South Dakota. She was the daughter of Henry F. Schroeder and Jessie V. Sherwood.